Kuririn (Japanese: クリリン, Hepburn: Kuririn), known as Krillin in Funimation's English subtitles and Viz Media's release of the manga, and Kulilin in Japanese merchandise English translations, is a fictional character in the Dragon Ball manga series created by Akira Toriyama. He is introduced in chapter #25 A Rival? Arrival!! (ライバル？参上! !, Raibaru? Sanjō!! ), first published in Weekly Shōnen Jump magazine on May 21, 1985, as Goku's fellow martial arts student under Kame-Sen'nin. As the series progresses, Krillin becomes Goku's closest ally and best friend as he fights every villain along with Goku or before him and is often depicted as the comic relief. 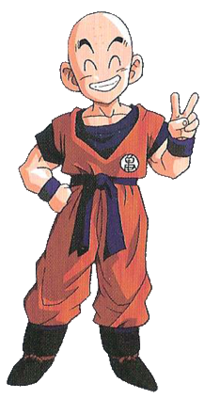 Toriyama originally created Krillin along with the Tenka'ichi Budōkai as a method to help add depth to the story, as his editor Kazuhiko Torishima had stated that the series' protagonist, Goku, was too plain. Torishima explained that in order to develop Goku's characterization, they needed someone petty and mischievous to provide contrast. Leading to the introduction of Krillin. Yūsuke Watanabe, who wrote the screenplay for the film Dragon Ball Z: Battle of Gods, had originally written the film to take place at Krillin and Android #18's wedding, but Toriyama wrote it to take place at Bulma's birthday party. Watanabe thought Toriyama made the change because he wanted fans to imagine the wedding for themselves. Toriyama cited Krillin and Bulma's older ages at the end of the manga as a reason he chose for Battle of Gods to take place after the Boo arc since they were in their "strongest condition at that time." Krillin's appearance stays relatively the same for the majority of the series. He is first introduced at age 13, with a shaved head and still dressed in the yellow-and-orange clothing worn at the monastery at which he had been training. He does not possess a visible nose, and has six spots of moxibustion burns on his forehead, a reference to the practice of Shaolin monks. Toriyama once stated, seemingly humorously, that Krillin's lack of a nose is because he has a "physical idiosyncrasy" that allows him to breathe through the pores of his skin. Later, he wears the orange gi uniform that is presented to both himself and Goku by Kame-Sen'nin in honor of their first martial arts competition. Occasionally he is seen in casual clothes, but for the most part continues to dress for training or fighting at all times. During the Freeza arc, he wears Saiyan armor provided by Vegeta, but during the Cell arc he returns to wearing the orange gi, accompanied by a blue short-sleeved undershirt and boots. After the defeat of Cell, Krillin stops shaving his head, and grows his black hair out, before later shaving it again during Frieza's resurrection. When he settles down with his family, Krillin is shown wearing a workout outfit consisting of a red "Tacos" T-shirt and brown drawstring pants. Krillin first appears arriving at Kame-Sen'nin's island to become his apprentice, meeting Son Goku, and the two become rivals. However, after doing the hardships that Kame-Sen'nin assigns, the two become friends. After finishing their training, Kame-Sen'nin has Krillin and Goku compete in the 21st Tenka'ichi Budōkai. Krillin beats the odored fighter Bacterian, who uses his stench as a weapon, and makes it to the semi-finals. However, he is defeated by Jackie Chun, who is really Kame-Sen'nin in disguise preventing his students from becoming arrogant with too many victories. Krillin continues to train with Kame-Sen'nin and helps Goku to collect the Dragon Balls by fighting against General Blue and participating in Baba Uranai's tournament. However, he is quickly defeated by Dracula Man, who bites down on his head, causing blood to pour out. Three years later, Krillin enters the 22nd Tenka'ichi Budōkai. Again, he makes it to the semi-finals by defeating Chaozu, but loses to Goku. Soon after, Krillin is killed by a henchman of Piccolo Daimao, who wanted to steal Goku's Dragon Ball. After Goku defeats Piccolo, Krillin is revived by the Dragon Balls. Another 3 years later, Krillin enters the 23rd Tenka'ichi Budōkai. This time however, he only makes it to the quarter-finals, losing to Piccolo Junior. Krillin then tries to intervene in the fight between Piccolo and Goku when Piccolo gains the upper hand, until realizing he is outclassed. Several years later, in the span of a day, Krillin is attacked by Raditz while attending a reunion, and is unable to save Gohan from Piccolo, who takes him for training. A year afterward, Krillin confronts the Saiyan invaders Vegeta and Nappa along with his friends, following months of training in preparation for their arrival. After Yamcha's death, he avenges his friend by killing most of the Saibermen. In the battle against Nappa, Krillin tries to get involved in his fight with Tenshinhan after Nappa severs the latter's arm, though is stopped by Nappa. Krillin double teams Nappa with Piccolo, creating multiple copies of themselves with the Tri-Form and failing thanks to the clones cutting their power. Krillin later goes toe-to-toe with Nappa alone, launching a Kienzan at him that Nappa almost catches before Vegeta warns him, and is saved from an attack from Nappa by Piccolo. After Nappa is defeated, and Goku arrives, Krillin requests that he fight Vegeta elsewhere to prevent their friends' corpses from being destroyed. He and Gohan leave the battlefield but return after Gohan worries for Goku, who is being crushed by Vegeta in his Oozaru form. Krillin unsuccessfully attempts cutting Vegeta's tail in a sneak attack, and later is given the Genki Dama to launch at Vegeta by Goku, which misses initially but is bounded back by Gohan. After Vegeta yields from further conflict given his extensive injuries, Krillin takes Yajirobe's sword and moves in to kill him, but agrees to spare his life per Goku's request. He then travels with Gohan and Bulma to planet Namek to use the Namekian Dragon Balls to revive their dead friends, since the Earth's Dragon Balls vanished due to Piccolo's death. Once there, they save a young Namekian called Dende from death at the hands of Freeza's henchmen. Krillin receives an increase in power from Guru, the grand elder of the Namekians, when he unlocks his hidden potential. After a few close encounters with Vegeta, Krillin and Gohan are forced to team up with him in order to fight Freeza's strongest warriors, the Ginyu Force. They are overpowered by them until Goku arrives and defeats the Force. After Krillin and Gohan collect the seven Dragon Balls and wish back Piccolo, they begin a battle against Freeza, during which Krillin is stabbed in the chest, removes Freeza's tail following being healed by Dende, thereby distracting Freeza from continuing to crush Gohan to death, and injures Vegeta in an attempt to capitalize on his Saiyan ability to grow stronger when in a near-death state at Vegeta's request. After a long fight between Goku and Freeza, Goku decides to use the Genki-dama, Krillin giving his energy to Piccolo so he can stall Freeza and attacking Freeza himself with his last bit of strength. When the group recovers from the Genki-dama, and Freeza emerges unscathed, the latter detonates Krillin from the inside, killing him instantly, which triggers Goku's first ever transformation into a Super Saiyan. After Freeza's defeat, Krillin is revived by the Namekian Dragon Balls. Krillin trains for three years to confront Dr. Gero who tries to use his androids to kill Goku. Krillin is momentarily forced to leave his friends with the androids to take Yamcha away from the battlefield in the aftermath of his deadly encounter with Gero, who Krillin finds the base of and signals the others to his location after having a fight with Gero. When the Androids, #16, #17 and #18 are released, Krillin is the only hero present that does not engage #17 and #18 due to his fear. After the duo defeat his friends, Krillin unsuccessfully pleads for the androids to spare Goku's life, and becomes infatuated with the female #18 after she kisses him on the cheek, and he then heals his defeated friends. After Krillin encounters the artificial life form Cell, Krillin and Trunks travel to Dr. Gero's laboratory basement, where Krillin kills the present timeline version of Cell and the two discover the weakness to the androids is a deactivating controller, which Bulma constructs and gives to Krillin. Krillin soon after encounters #18 with the module and after a period of deliberation, destroys it. Because of this, regardless of his efforts, Cell absorbs her and achieves his perfect form. Enraged over her loss, Krillin engages Cell in combat, the latter standing in place while Krillin's attacks have no effect and striking Krillin only once, placing Krillin in a near-death state. After Krillin is revived by Trunks, he warns Trunks of Cell's strength, having been able to sense his true power right before being attacked. He moves Vegeta away from the impending fight between Trunks and Cell, healing Vegeta during the battle between the two. He later participates in the Cell Games, a martial arts tournament created by Cell for entertainment, and fights one of the Cell Juniors who attack him and his friends, but is saved by Gohan. After Gohan punches Cell in the stomach, he regurgitates Android #18 and Krillin cares for her comatose body while Gohan destroys Cell. After Cell's death, Krillin then travels to the lookout, where he uses the second wish from the Dragon Balls to remove the bombs from #17 and #18. Seven years later, Krillin has quit fighting, settled down with #18, with whom he has a daughter named Marron (マーロン, Māron). This left Goku confused, until Krillin explained that Android 18 is a cyborg (meaning she is human still), and she was able to have a baby with him. However, after learning of Goku's return from the afterlife to compete in the 25th Tenka'ichi Budōkai, he decides to also participate, also being encouraged to do so for the money by #18. During Goten and Trunks' match, Krillin worries that Trunks' energy attack will hit the crowd. Krillin wins his sole match, against Pintar, during the competition with ease. After the Kaiō-shin enlists several of Krillin's friends to help him defeat the wizard Bobbidi, Krillin joins them, in doing so forfeiting his entry in the tournament, but is stopped from assisting any further thanks to Dabura turning him into stone with his spit. Upon Dabura's death however, Krillin is freed and he saves Goten and Trunks from the impact of Vegeta's self-explosion. Krillin later evacuates Earth after Majin Boo's awakening. When Boo has transformed, he finds Krillin's groups and kills them. During Goku and Vegeta's fight against Boo, Krillin is brought back to life by the Namekian Dragon Balls and gives his energy to Goku's Genki-Dama attack, which is used to destroy Boo. Krillin appears in two of the three Dragon Ball films; in the second, Krillin is used as leverage by Lucifer to convince Goku to give the Sleeping Princess to him; and in the third, Krillin trains for the World Martial Arts Tournament, held in Mifan. Krillin appears in fourteen out of the fifteen Dragon Ball Z films; in the first movie, he assists during the battle against Garlic Junior after he kidnaps Gohan; in the second, Krillin battles Dr. Willow, firing a Kamehameha wave in an unsuccessful attempt to defeat him; in the third, Krillin unintentionally brings Turles to Earth by using the Dragon Balls to restore the forest after a fire and fights the Saiyan's henchmen; in the fourth, Krillin tries to prevent the Earth from being destroyed by a meteorite containing Lord Slug and his henchmen; in the fifth, Krillin shelters Goku after he is injured by Cooler and is defeated in a fight with Salza; in the sixth, Krillin travels to New Namek and combats Cooler's forces; in the seventh, Krillin avoids fighting Android 13 though is injured during the battle; in the eighth, Krillin tours New Planet Vegeta; in the ninth, Krillin participates in a tournament and fights Zangya; in the tenth, Krillin comes to the aid of Trunks and Goten in combating Broly; in the eleventh, Krillin, Android 18, Goten and Trunks combat the bio-engineered Broly in a factory; in the thirteenth, Krillin appears before Hirudegarn is released; in the fourteenth, Krillin backs down from engaging Beerus due to not knowing his power; and lastly, in the fifteenth, Krillin works as a police officer and after having his head shaven by Android 18, joins in the fight against the resurrected Freeza afterward. After the events of the last two films, Krillin assists in acquiring two more members for his universe's team in a tournament, namely Piccolo and Majin Boo, after learning about it from Android #18 and reunites with Trunks, who he tries to stop from attacking Android #18 when she greets him, revealing her as his wife. #18 tries to get Krillin a gift with the Dragon Balls until being convinced by Bulma her presence alone is good enough for him, and Krillin later participates in a baseball game between Universes 6 and 7. Krillin tries stopping a pair of wrongdoers when he is knocked out by an arriving Gohan in his Saiyaman guise. Krillin agrees to train with Goku after some reluctance and the two travel to get Paradise Grass from an island, encountering large, physical versions of past enemies that Krillin becomes fearful of. The two are revealed to be in the "Forest of Fear", Krillin saving Goku from a phantom of Super Shenron that the two destroy together. Krillin is requested by Goku and Gohan for participation in the Tournament of Power; he accepts. Krillin eliminates Universe 4's Shosa and Majora before being eliminated himself by Frost. Krillin's shouts of encouragement for Android 18 contribute to her victory over Universe 2's Ribrianne, and he feeds Vegeta a Senzu Bean after his elimination by Universe 11's Jiren. 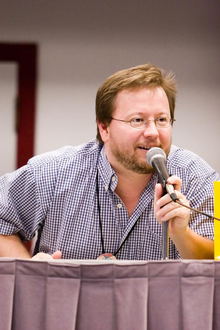 Sonny Strait is Krillin's most well known and most consistent English voice actor for his teen and adult incarnations. Krillin is voiced by Mayumi Tanaka in the original Japanese anime and in all related media. Toriyama chose Tanaka after hearing her portrayal of the protagonist Giovanni in the film Night on the Galactic Railroad. When Krillin and Yajirobe, another character voiced by Tanaka, appeared in the same frame she gave the latter a Nagoya dialect in order to distinguish them. When Dragon Ball received a short-lived English dub by Saban Entertainment, Funimation, and Ocean Productions in the mid 1990s, Krillin would be voiced by Terry Klassen. He would reprise his role in the Ocean dub of the latter half of the series produced by AB Groupe for European and Canadian markets. Another short-lived English dub produced by Harmony Gold in the late-1980s featured Wanda Nowicki as the voice of Krillin (here named Bongo). In the Blue Water 2003 re-dub of Dragon Ball, he is voiced by Mike Thiessen. Dan Gascon voiced him in the Blue Water dub of Dragon Ball GT. When the series' full production was taken over by Funimation in the US, Krillin would be voiced by Laurie Steele as a child in Dragon Ball and Sonny Strait as an adult in all media released to the US. Strait gained the role following auditioning in Texas and moved to Los Angeles to keep it. He found the character's constant deaths amusing and thought him comical: "Krillin is the party. If you don’t wish back the party, you’re going to be bored." In the rare English dub distributed exclusively in Europe by AB Groupe he was voiced by Sharon Mann (here named Clearin). Apollo Abraham voiced Krillin (here named Kurin) in an English dub distributed in the Philippines by Creative Products Corporation. Krillin is voiced by Brian Beacock in the Toonami Asia broadcast of Dragon Ball Super. Krillin has many abilities including super-strength, super-speed, and the ability to fly using his ki energy, known as Bukū-jutsu (舞空術, lit. "Air Dance Technique"). His main techniques include the Kamehameha (かめはめ波, lit. "Turtle Destruction Wave"), an attack he learned from Master Roshi, which enables him to emit a powerful ki energy blast from his hands. Kakusandan (拡散弾, lit. "Scattershots"), another chi attack, involves firing two blasts, one from each hand, and merging them before directing the blast above an opponent where it will break up and rain down on them, he was only seen using this twice—the first time was very successful as he managed to wipe out three Saibamen with it. From Tenshinhan, he obtained the Taiyōken (太陽拳, lit. "Solar Fist", renamed "Solar Flare" in the English anime dub), an attack Krillin is capable of using to blind his opponents, sometimes used to make a quick escape. One of his signature techniques is the Kienzan (気円斬, lit. "Energy Disc Razor", renamed "Destructo Disc" in the English anime dub), where he puts a hand in the air to create an electric floating disc, using it to slice through his enemies. Lacking the other protagonists' advantage of getting stronger every time he is injured, Krillin is however the strongest Earthling and was recognized as having great technique by Vegeta. Krillin and One Piece character Monkey D. Luffy in an advertisement used to promote the animation block Dream 9. In a filler episode of Dragon Ball, Krillin trains with Kame-Sen'nin and after the 23rd Tenka'ichi Budōkai, Krillin can be seen on a plane with his friends. In filler episodes of Dragon Ball Z, during the Saiyan arc, Krillin fails to tell Chi-Chi of Goku's passing after being tasked with informing her, though does inform Yamcha when coming to one of his baseball games followed by recruiting him for training with Kami, and trains for the Saiyans by facing members of their race from the past using the Pendulum Room. Before the Namek arc, Krillin encounters a group of children who help him find Namek and spends some time on a fake version of the planet searching for Dragon Balls during a distraction and preventing his ship from being stolen. After the Namek arc, Krillin is one of a few not affected by the Black Water Mist set by Garlic Jr., Krillin having to fight his friends before journeying to Kami's Lookout, where he appears to fall under the effects of the Black Water Mist, only to be revealed as faking as part of a plan by Piccolo. Krillin's near-death state by the hands of the Spice Boys, Spice and Vinegar, triggers Gohan's power boost and subsequent killing of the pair. During this time, he breaks up with Maron once he becomes convinced she deserves better than himself, learning afterward that she would have married him. During the Cell arc, he stops Cell from murdering a girl and her younger brother and while waiting for the Cell Games, celebrates Gohan's birthday. In the Boo arc, Krillin charges Boo after Boo escapes the Room of Spirit and Time, being easily defeated and attacks Boo again in the afterlife. After Boo's defeat, Krillin attends a gathering with his family. In Dragon Ball GT, Krillin is killed by Android #17 after succeeding in snapping Android #18 from his brainwashing and trying to persuade him against his developing villainy. His death prompts #18 to seek vengeance and assist Goku in defeating Super 17. Krillin is revived by Shenlong after the defeat of Omega Shenron and has a match with Goku, who decided to leave Earth. He is shown in GT sporting a mustache, wearing grey pants, shirt and tie with a cardigan in his few appearances. Krillin appears in multiple Dragon Ball-related video games, sometimes as a playable character. He also appears in the crossover game Jump Superstars. In the 1992 Videkko game Dragon Ball: Get Together! Goku World, Krillin along with Goku, Trunks, Bulma, and Gohan travels back in time to examine event in the past. In the 2002 game Dragon Ball Z: Budokai, Cell has a nightmare where he accidentally absorbs Krillin and becomes Cellin (セルリン, Serurin), the form making him weaker. In the 2015 video game Dragon Ball: Xenoverse, Krillin serves as a mentor to the player character, teaching his Kienzan. He also appears during Android 18's mentorship of the player, fighting them alongside her. In the Freeza arc, Krillin and Vegeta being defeated by Freeza, leaving Gohan alone to fight the tyrant, causes Goku to exit the healing chamber still wounded. In the final fight against Demigra, Krillin gives energy to the player. In the 2016 game Dragon Ball Xenoverse 2, during the Freeza arc, the player assists Krillin in battling Zarbon, and Krillin later leaves the player to fight Lord Slug and Turles alone per the player's request. In the 2018 game Dragon Ball FighterZ, after clones of various heroes and villains from the series appear, Krillin investigates the origin of them before being knocked out by his own clone. Following Goku rescuing him, the two rescue various allies from clones until encountering Cell, who Krillin becomes aggressive toward for his defeat of Android 18. In June 1988, Krillin along with other Dragon Ball characters were featured in two public safety announcement shorts. The first was entitled The Goku Traffic Safety (悟空の交通安全, Gokū no Kōtsū Anzen), and the second called The Goku Fire Fighting Regiment (悟空の消防隊, Gokū no Shōbō-tai) where he along with Kame-Sen'nin, Yamcha, and later Goku become volunteer fire fighters. Krillin also appears in the Dragon Ball and One Piece crossover manga Cross Epoch where he and Tony Tony Chopper run the Kuri-Chopa Marine Train Coster. In 2003, he would appear in the interactive feature entitled Kyutai Panic Adventure! (球体パニックアドベンチャー!, Kyūtai Panikku Adobenchā!, Orb Panic Adventure!). Where he and Gohan attempt to save visitors of at Fuji Television's orb section from drowning, while Goku battles Freeza. In the 2004 followup Kyūtai Panic Adventure Returns! (球体パニックアドベンチャーリターンズ!, Kyūtai Panikku Adobenchā Ritānzu!, Orb Panic Adventure Returns! ), Krillin is one of the seven Dragon Ball characters who delivers the Dragon Balls to restore the aqua city of Odaiba after Goku and Monkey D. Luffy's battle with Eneru. Krillin has performed many songs throughout the years. These songs feature his voice actor Mayumi Tanaka in character singing cheerfully about certain thing pertaining to Krillin. First with the song "Asa - Hiru - Yoru - Kimi - Boku" from the album Dragon Ball Z Hit Song Collection IV: Character Special released in 1990. Then with "Ichido wa Kekkon Shitai Manbo" from Dragon Ball Z Hit Song Collection 8: Character Special 2 released in 1991. Where he happily sings about the desire to get married. And the title track from Dragon Ball Z Hit Song Collection 17: Hippy Hoppy Shake!! released in 1995. Before and after Dragon Ball Z debuting in the U.S. in 1996, Krillin became a part of the country's pop culture. In 1994, the character was featured on the cover of Voodoo Glow Skulls' first full-length album Who Is, This Is?, though his face was removed in the 2012 digital re-release. The song "Blessing" by Chance the Rapper mentions Krillin referencing Android 18 to the lyricist's delight. Krillin appears in an episode of Mad watching the other Dragon Ball characters after they are drafted for the Oakland A's by Billy Beane in a parody of the film Moneyball. Krillin is a popular character in the series; in 2004 Japanese fans voted him the seventh most popular character. In January 2007, Oricon held a poll in which they asked Japanese fans of manga and anime which characters from any series they would most like to see in spin-off series. Krillin ranked third in the men's poll and sixth in the overall poll. In 2016, Krillin was ranked No. 3 on the saikoplus.com list 10 Most Popular Characters in Dragon Ball Z. When younger fans would belittle the character as weak, Krillin's voice actress Mayumi Tanaka said she would explain to them that Krillin and Yamcha are the strongest earthlings, the other characters are all aliens. She also said it was more fun to play Krillin when he was a dirty-minded bad kid, that she was not fond of him growing his hair out and was shocked when he died for the first time. Various publications for manga, anime and other media have commented on Krillin's character, adding praise and criticism to his development and traits in the series. Anime News Network writer Carl Kimlinger liked Krillin and Goku's childhood, noting it to be the warmth that the later Dragon Ball Z anime does not have. Also believing the first anime to have more development than the sequel, Tim Jones from Them Anime Reviews cited how Krillin was not a friend to Goku when first introduced. David F. Smith of IGN comments that Krillin and #18's relationship really help make the storyline more interesting. Additionally, he liked Krillin's appearances in the fight against Cell as he has more screen time than the main character, Goku. Although Chris Beveridge from Mania Entertainment thought that Krillin had a drastic change in Dragon Ball GT, he mentioned that fans from the previous series would like some of its episodes due to the appearance of Krillin and other older characters. ^ "週刊少年ジャンプ　1985/05/21 表示号数25". Media Arts Database (in Japanese). Agency for Cultural Affairs. Retrieved March 21, 2017. ^ Toriyama, Akira (August 9, 1995). "鳥山明的超会見　第２回". ＤＲＡＧＯＮ　ＢＡＬＬ　大全集　➋「ＳＴＯＲＹ　ＧＵＩＤＥ」. Shueisha. pp. 261–264. ISBN 4-08-782752-6. ^ Interview de l'éditeur de Dragon Ball - La naissance de Dragon Ball - Partie 4 (web video). Kazé. January 12, 2015. Retrieved May 29, 2017. ^ "Akira Toriyama Interview (Dragon Ball Z: Battle of Gods)". saiyanisland.com. March 17, 2013. ^ Toriyama, Akira (December 1, 1987). Dragon Ball 冒険 Special [Dragon Ball: Adventure Special]. Dragon Ball (in Japanese). Shueisha. p. 138. ^ a b Dragon Ball manga, volume 3, chapter ? ^ Dragon Ball Z manga, volume 9, chapter ? ^ Dragon Ball Z manga, volume 12, chapter ? ^ a b Dragon Ball Z manga, volume 20, chapter ? ^ Dragon Ball manga, volume 2, chapter ? ^ Dragon Ball manga, volume 10, chapter ? ^ Dragon Ball manga, volume 12, chapter ? ^ Dragon Ball manga, volume 14, chapter ? ^ "Goku Hangs On". Dragon Ball. Episode 147. March 1, 1989. ^ "The Power of Nappa". Dragon Ball Z. Episode 24. July 18, 2005. ^ "Sacrifice". Dragon Ball Z. July 19, 2005. ^ "Nimbus Speed". Dragon Ball Z. Episode 27. July 21, 2005. ^ "Hero in the Shadows". Dragon Ball Z. Episode 33. July 29, 2005. ^ Dragon Ball Z manga, volume 5, chapter ? ^ "Guru's Gift". Dragon Ball Z. Episode 54. July 4, 1990. ^ Dragon Ball Z manga, volume 8, chapter ? ^ "Power of the Spirit". Dragon Ball Z. Episode 94. June 12, 1991. ^ "Krillin's Decision". Dragon Ball Z. Episode 158. September 23, 1992. ^ Dragon Ball Z manga, volume 16, chapter ? ^ "Cell is Complete". Dragon Ball Z. Episode 160. October 14, 1992. ^ "Vegeta Must Pay". Dragon Ball Z. October 21, 1992. ^ Dragon Ball Z manga, volume 19, chapter ? ^ "Who Will Fight Who?". Dragon Ball Z. Episode 214. January 26, 1994. ^ "Kings of the Demons". Dragon Ball Z. Episode 221. March 16, 1994. ^ "Meal Time". Dragon Ball Z. Episode 235. August 3, 1994. ^ "Revival". Dragon Ball Z. Episode 240. September 21, 1994. ^ Dragon Ball Z manga, volume 26, chapter ? ^ "2015 Dragon Ball Film's Krillin Character Sketch Revealed". Anime News Network. December 26, 2014. Martinez, Phillip (December 30, 2014). "'Dragon Ball Z: Fukkatsu No F' Krillin Character Art Has Fighter Become A Cop". iDigitalTimes. ^ "Rehearsing for the "Martial Arts Tournament" Who Are the Two Remaining Members?!". Dragon Ball Super. Episode 30. February 7, 2016. ^ "A Message from the Future Goku Black Invades!". Dragon Ball Super. Episode 49. June 26, 2016. ^ "Reveal Black's True Identity! Off to the Kaioshin Realm of Universe 10". Dragon Ball Super. Episode 53. July 31, 2016. ^ "Come Forth, Shenron! Whose Wish Shall Be Granted!?". Dragon Ball Super. Episode 68. November 27, 2016. ^ "Champa's Challenge! This Time We Face Off in Baseball". Dragon Ball Super. Episode 70. December 11, 2016. ^ "Gohan's Disaster! Great Saiyaman's Unbelievable Movie Adaptation?!". Dragon Ball Super. Episode 73. January 8, 2017. ^ "Goku and Kuririn — To the Nostalgic Training Place". Dragon Ball Super. Episode 75. January 21, 2017. ^ "Defeat These Terrifying Enemies! Krillin's Fighting Spirit Returns!". Dragon Ball Super. Episode 76. January 29, 2017. ^ "Son Goku the Recruiter Invites Krillin and No. 18". Dragon Ball Super. Episode 84. April 2, 2017. ^ "Show Them! Krillin's True Power!!". Dragon Ball Super. Episode 99. ^ "Showdown of Love! Androids VS Universe 2!!". Dragon Ball Super. Episode 117. November 26, 2017. ^ "Noble Pride To The End! Vegeta Falls!!". Dragon Ball Super. Episode 128. February 18, 2018. ^ Toriyama, Akira (September 9, 1995). "鳥山明的超会見" [Akira Toriyama Super Interview]. Dragon Ball 大全集 3 TV Animation Part 1 [Dragon Ball Great Complete Collection 3 TV Animation Part 1]. Dragon Ball (in Japanese). Shueisha. p. 202. ISBN 4-08-782753-4. ^ a b DRAGON　BALL　大全集　補巻 TV ANIMATION PART 3. Shueisha. 1996. pp. 107–113. ISBN 4-08-102019-1. ^ "EXCLUSIVE INTERVIEW WITH SONNY STRAIT!". House of Geekery. April 5, 2016. ^ "Dragon Ball Z: Big Green Dub Cast - Behind The Voice Actors". www.behindthevoiceactors.com. Retrieved 2016-07-12. ^ Dragon Ball manga, volume 11, chapter ? ^ Dragon Ball Z manga, volume 6, chapter ? ^ "Kazuya Nakai, Shiro Saito, Shokotan Join 2015 Dragon Ball Z Film's Cast". Anime News Network. 2015-02-24. Retrieved 2015-03-11. ^ "The Legend of a Dragon". Dragon Ball. Episode 33. February 15, 2002. ^ "Day 1". Dragon Ball Z. Episode 7. June 14, 1989. ^ "A New Friend". Dragon Ball Z. Episode 10. June 28, 2005. ^ "Pendulum Room Peril". Dragon Ball Z. Episode 17. July 7, 2005. ^ "Held Captive". Dragon Ball Z. Episode 40. August 10, 2005. ^ "Black Fog of Terror". Dragon Ball Z. Episode 109. April 15, 2000. ^ "Call for Restoration". Dragon Ball Z. Episode 112. May 6, 2000. ^ "Suicidal Course". Dragon Ball Z. Episode May 13, 2000. May 13, 2000. ^ "Extreme Measures". Dragon Ball Z. Episode 114. May 20, 2000. ^ "Krillin's Proposal". Dragon Ball Z. Episode 117. September 1, 2000. ^ "Our Hero Awakens". Dragon Ball Z. Episode 146. October 12, 2000. ^ "Memories of Gohan". Dragon Ball Z. Episode 171. November 20, 2000. ^ "17 Times 2" / "The Ultimate Android! The Two #17s Unite". Dragon Ball GT. Episode 44. April 30, 1997. ^ "Until We Meet Again" / "Goodbye, Goku... 'Till the Day We Meet Again". Dragon Ball GT. November 19, 1997. ^ "The Tuffle Gorilla Attacks!". Dragon Ball GT. Episode 36. February 5, 1997. ^ Nix (July 22, 2005). "Jump Superstars: Character Roster". IGN. Retrieved May 29, 2009. ^ Toei Animation (1992). Dragon Ball Z: あつまれ!! 悟空ワールド (in Japanese). Videkko. Bandai. ^ Buzzi, Matthew (January 26, 2015). "Dragon Ball Xenoverse Character Number And Skill Details Leaked In Online Posting For Guidebook". GameNGuide. ^ Dimps (October 25, 2016). Dragon Ball Xenoverse 2. Bandai Namco Entertainment. Krillin: Wh-Who are you?! Are you here to help us out?! ^ Dimps (October 25, 2016). Dragon Ball Xenoverse 2. Bandai Namco Entertainment. Krillin: Gohan, we'll be in the way if we stick around. Sometimes you need to trust in others, you know? ^ Arc System Works (January 26, 2018). Dragon Ball FighterZ. Bandai Namco Entertainment. Krillin: Thanks, Goku. You never let me down. ^ Arc System Works (January 26, 2018). Dragon Ball FighterZ. Bandai Namco Entertainment. Krillin: What have you done to my wife?! ^ a b Dragon Ball DVD Box: DragonBox (Booklet) (in Japanese). Minoru Okazaki & Daisuke Nishio. Japan: Pony Canyon. 2004 [1986-1989]. 50482. ^ "Fuji TV News". Fuji TV. 2003. Archived from the original on May 22, 2016. Retrieved September 25, 2008. ^ "Fuji TV listing". Fuji TV. Archived from the original on May 22, 2016. Retrieved September 25, 2008. ^ "Star*Tech event listings". Star*Tech. Archived from the original on January 4, 2003. Retrieved September 25, 2008. ^ Dragon Ball Z Hit Song Collection IV: Character Special (CD) (in Japanese). Mayumi Tanaka. Japan: Columbia Records. October 1, 1990. COCC-6830. ^ Dragon Ball Z Hit Song Collection 8: Character Special 2 (CD) (in Japanese). Mayumi Tanaka. Japan: Columbia Records. September 21, 1991. ^ Dragon Ball Z Hit Song Collection 17: Hippy Hoppy Shake!! (CD) (in Japanese). Mayumi Tanaka. Japan: Columbia Records. March 1, 1995. ^ Wilder, Charlotte (May 13, 2016). "The 18 best '90s kid moments on Chance the Rapper's new mixtape". USA Today. ^ "Money Ball Z / Green Care Bear". Mad. November 21, 2011. Cartoon Network. ^ Dragon Ball Forever (in Japanese). Shueisha. 2004. ISBN 4-08-873702-4. ^ "Oricon: Fans Want L, Char Aznable Spinoffs". Anime News Network. 2007-01-08. Retrieved 2009-06-08. ^ "10 Most Popular Characters in Dragon Ball Z". saikoplus.com. February 25, 2016. Archived from the original on February 20, 2017. ^ Kimlinger, Carl (March 26, 2008). "Dragon Ball Movies DVD Box Set (Movies 2-4)". Anime News Network. Retrieved May 23, 2009. ^ Jones, Tim. "Dragon Ball Review". Them Anime Reviews. Retrieved May 23, 2009. ^ Smith, David (June 16, 2008). "Dragon Ball Z: Season Five DVD Review, You probably know the drill by now, as we plow into the long Cell Saga". IGN. Retrieved May 21, 2009. These storylines are a little more interesting, thanks to subplots like Krillin's relationship with Android 18 and the team-up between Trunks Vegeta and Picolo. ^ Beveridge, Chris (January 8, 2004). "Dragon Ball GT Vol. #09: Calculations". Anime News Network. Archived from the original on October 18, 2012. Retrieved May 23, 2009. This page was last edited on 3 April 2019, at 17:22 (UTC).